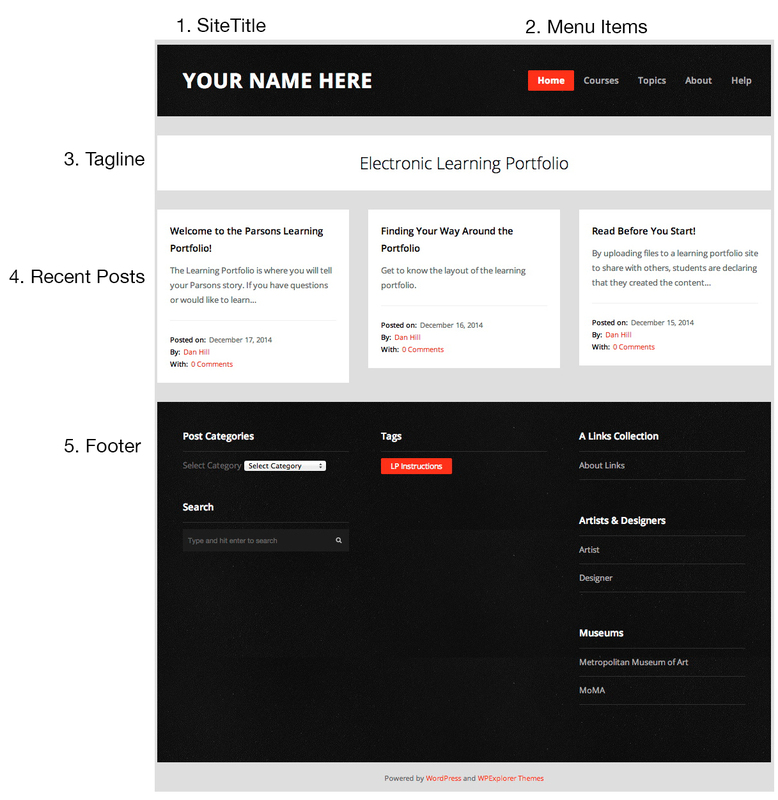 Get to know the layout of the learning portfolio. The WordPress theme used by the learning portfolio is called Tetris – Newschool.edu. After much research and testing, the Tetris theme was selected for its compatibility with the goals of the learning portfolio. The theme has been customized to meet the needs of The New School, in general, and Parsons students, in particular. You may personalize Tetris by changing the site title, the tagline and the background color. You may also add a background image to the page and an image logo to the title bar. But do not select a different theme for your learning portfolio. Doing so may disable features that have been built into this template and render your learning portfolio difficult for visitors to read, navigate and search. For the learning portfolio to be used successfully across the curriculum, it is necessary for all students to use the Tetris – Newschool.edu theme. The sidebar on the right side of this window is present when viewing a post. It will be visible when viewing a page, if the page uses the default page template. Currently, the sidebar contains a search box, a tag list (more info below), a list of recent posts and an archive of posts grouped by month. This is what the homepage of a new learning portfolio looks like. The Site Title is where you put your name. It is also a link to the homepage of your learning portfolio. The Menu Items are critical for you and others to easily navigate the contents of your portfolio. Home brings you back to the front page of your learning portfolio. Think of the Courses menu and the Topics menu as being like the Author and Subject indices of a library catalog. They are two different ways of describing your posts. The Courses menu is based on categories. 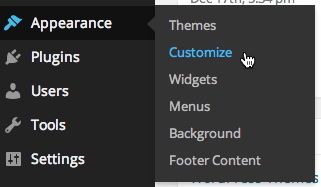 The Topics menu is based on tags. Be sure to read About the Courses Menu and About the Topics Menu so that you can make them work for you. About links to a page where you can put some information about yourself. Help links to lots of instructions and tutorial on building and managing your learning portfolio. The Tagline lets the visitor know what kind of web site this is. Your Recent Posts will appear in this section with the most recent post in the upper left. You can set the maximum number of post to appear via Settings>Readings in the Dashboard. The default number is 10. The Footer contains additional tools for navigating the portfolio. Post Categories is a pull-down menu from which you can select any category that has been used. Doing so will aggregate all posts that have been assigned a particular category. This is similar to the Courses menu, but you might create new categories that are not course-specific. All of your categories currently in use will appear here. Search is just what you’d expect. Tags is a list of tags currently in use. Clicking on any one of them will aggregate all posts that have been assigned that particular tag. The difference between this and the Topics menus is that this area will automatically lists all of the tags you have used. Links are automatically placed here whenever you create them. Read About Links to learn more.